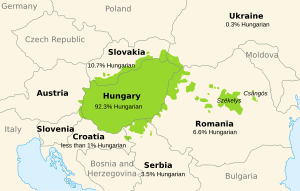 Hungarian is spoken by about 14 million people. Most of its speakers live in Hungary (around 10 million) and Romania (around 1.5 million), but it is also spoken in Slovakia, the northern part of Serbia (Vojvodina), Ukraine and other countries. Hungarian is the official language of the Republic of Hungary and one of the official languages of the EU (European Union). It is also an official language of the Autonomous Republic of Vojvodina (Serbia) and of some places in the Republic of Slovenia. Hungarians call their language magyar. Hungarian grammar is rather different from the grammar of Indo-European languages. People may find this grammar complicated the first time if they speak an Indo-European language, until they realize that it works along some pretty logical rules. Hungarian has no grammatical gender. For example there are no separate words for 'he' and 'she' but there is one pronoun ('ő'). Instead of prepositions (like English 'from' or 'with'), Hungarian has suffixes (little words stuck to the end of main words). 'From Budapest' becomes 'Budapestről', and 'with Alexandra' becomes 'Alexandrával' in Hungarian. Another feature of the language is vowel harmony. This means that suffixes must tone in (harmonize) with the vowel of the main word. To over-simplify it, if they have an 'a' in the word then the suffix will also contain an 'a' ('fa' - 'tree' and 'fával' - 'with a tree'), and if their word has an 'e' then its suffix too will get an 'e' (teve - 'camel' and 'tevével' - with a camel). In Hungarian they must put the stress always on the first syllable (the beginning) of the words. Hungarian is written in the Latin alphabet. Some letters have accents (dots or commas above them) so while the English alphabet has 26 letters, Hungarian has 44. The writing of Hungarian is largely phonetic. This means that each letter has its own pronunciation, and it is easy to read any text once they learn how the letters are pronounced. 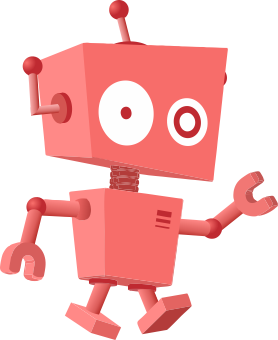 Hungarian language Facts for Kids. Kiddle Encyclopedia.